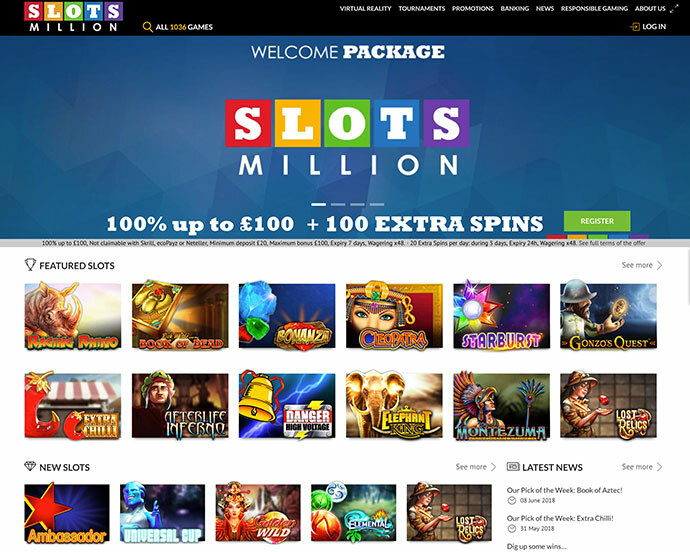 Software: Playtech, Microgaming, NetEnt, Rival, GamesOS, Cryptologic, Betsoft, Bally, Play'n GO, Saucify, NextGen Gaming, 1x2 Gaming, Blueprint Gaming, iSoftBet, Genesis Gaming, Leander Games, Quickspin, Yggdrasil Gaming, Rabcat, Edict, Playson, Thunderkick, 2 By 2 Gaming, Nektan, Euro Games Technology, Big Time Gaming, Games Warehouse, Elk Studios, Casino Technology, Lightning Box, Gamomat, GECO Gaming Group, Core Gaming, Ainsworth Gaming Technology, MGA, Pragmatic Play, Nolimit City, Red Tiger Gaming, Noble Gaming, Red Rake Gaming, Felix Gaming, Foxium, Just For The Win, Booongo Gaming, WagerMill, Iron Dog Studios, Games Lab, Spieldev. SlotsMillion is certified by eCOGRA. Deposit Methods: EcoPayz, Neteller, paysafecard, iDEAL, Sofortuberwaisung, Credit Cards, Skrill, Siru Mobile, Zimpler.